I've been thinking a lot about natural options for makeup lately. You know, ways to beautify your look without the use of harsh ingredients that can sometimes cause more harm then not! Seriously, just today on the news, there was a report linking lipstick to cancer! Whaaaat? Ladies, you know i LOVE my bold lips! So what can we do to protect ourselves? Surely there are options right? When the sweet people over at Real Purity contacted me, i was immediately intrigued by their 'all natural' makeup options. The real question is... do they work? Are they any good? Well, lucky for me, i was able to sample some of these products for myself to determine if they could truly stand up to some of my usual faves! Here were some of my faves from the pack! 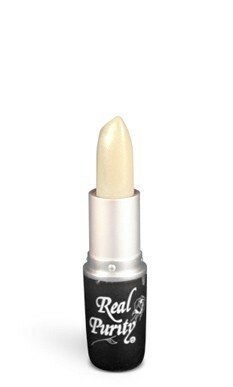 Real Purity's Vitamin E stick is a deliciously smooth lip treatment that leaves your pout longing for more. A few swipes of this pretty baby and your lips will feel instantly smooth and ready for a serious make out session! The Duo Eye Shadow combos offer a variety of fun colors to play up your eye look. My favorite this spring is the Lemon/Lime combo. What better way to play up the warm sun then with some happy yellows right? This combo is well pigmented and matte which i love! It's totally buildable and lasts for several hours with the right primer. Another fave was the Creme Blush in Cinnamon! In fact, i kind of like it as a lipstick too! Cinnamon is such a versatile shade that works well to give you that perfect sun kissed glow yet works beautifully to enhance your lips! Dare i say, this could very well be a.... multi-tasking product? Why not?! Overall, i was pretty impressed with the quality of this makeup. I wasn't sure what to expect at first but was pleasantly surprised! It's nice to know that you have options when it comes to naturally based makeup! So lets chat! Have you tried Real Purity makeup? What were your faves? *Press samples sent for consideration. All opinions are mine. This is not a sponsored post. Oh my gosh, that blush! Ahh, I love it! It looks absolutely gorgeous. I really liked the lipstick and blush, too. I thought the lipstick was SUPER creamy! I think all natural makeup is getting better and better. That blush looks great!